(PhysOrg.com) -- An international team, including Oxford University scientists, has discovered six diverse new planets, from 'shrunken-Saturns' to 'bloated hot Jupiters', as well a rare brown dwarf with 60 times the mass of Jupiter. The CoRoT (Convection, Rotation and Transits) space telescope is operated by the French space agency CNES. It discovers planets outside our solar system - exoplanets - when they ‘transit’, that is pass in front of their stars. Once CoRoT detects a transit, additional observations are made from the ground, using a number of telescopes all over the world. Although astronomers cannot see the planets directly, they use the space- and ground-based data to measure the sizes, masses, and orbits of these new planets precisely. This is why, among all known exoplanets, those with transits yield the most complete information about planet formation and evolution. ‘Every discovery of an extrasolar planetary system is a new piece in the puzzle of how these systems do form and evolve. The more systems we uncover, the better we can hope to understand the processes at play,’ said Magali Deleuil, researcher at the Laboratoire d'Astrophysique de Marseille (LAM) and head of the CoRoT exoplanet program. CoRoT-8b: the smallest in this batch: At about 70% of the size and mass of Saturn, CoRoT-8b is moderately small among the previously known transiting exoplanets. Its internal structure should be similar to that of ice giants, like Uranus and Neptune, in the Solar System. It is the smallest planet discovered by the CoRoT team so far after CoRoT-7b, the first transiting Super-Earth. CoRoT-10b: the eccentric giant: The orbit of CoRoT-10b is so elongated that the planet passes both very close to and very far away from its star. The amount of radiation it receives from the star varies tenfold in intensity, and scientists estimate that its surface temperature may increase from 250 to 600°C, all in the space of 13 Earth-days (the length of the year on CoRoT-10b). CoRoT-11b: the planet whose star does the twist: CoRoT-11, the host star of CoRoT-11b, rotates around its axis in 40 hours. For comparison, the Sun’s rotation period is 26 days. It is particularly difficult to confirm planets around rapidly rotating stars, so this detection is a significant achievement for the CoRoT team. CoRoT-12b, 13b and 14b: a trio of giants: These three planets all orbit close to their host star but have very different properties. Although CoRoT-13b is smaller than Jupiter, it is twice as dense. This suggests the presence of a massive rocky core inside the planet. With a radius 50% large than Jupiter’s (or 16 times larger than the Earth’s), CoRoT-12b belongs to the family of `bloated hot Jupiters’, whose anomalously large sizes are due to the intense stellar radiation they receive. On the other hand, CoRoT-14b, which is even closer to its parent star, has a size similar to Jupiter’s. It is also massive, 7.5 times the mass of Jupiter, which may explain why it is less puffed up. Such very massive and very hot planets are rare, CoRoT-14b is only the second one discovered so far. CoRoT-15b: the brown dwarf: CoRoT-15b’s mass is about 60 times that of Jupiter. This makes it incredibly dense, about 40 times more so than Jupiter. For that reason, it is classified as a brown dwarf, intermediate in nature between planets and stars. Brown dwarfs are much rarer than planets, which makes this discovery all the more exciting. Dr Suzanne Aigrain leads a team of UK researchers at the Universities of Oxford, Exeter and St Andrews who participate in the CoRoT exoplanet program. OxSciBlog: What is a brown dwarf? Suzanne Aigrain: A brown dwarf [BD] is a celestial object intermediate in mass between a planet and a star. It's helpful to recall the definition of a star: a star is a ball of gas held together by its own gravity and which radiates light produced by thermonuclear reactions in its core, mainly burning Hydrogen to produce Helium. A brown dwarf is an object very much like a star, but which is not massive enough to burn Hydrogen in its core. As such, brown dwarfs are faint and radiate mainly in the infrared, slowly releasing the heat they accrued during their formation. On the other hand, according to the International Astronomical Union's definition, a planet is also held by its own gravity but it is a) in orbit around a star or brown dwarf and b) not massive enough to burn Deuterium (Deuterium is an element which burns even more easily than Hydrogen). Any object which has a mass below the Hydrogen limit but above the Deuterium limit is thus a brown dwarf. This is the case for CoRoT-15b. The definitions I have given above leave a rather fuzzy area for the case of object which are below the Deuterium burning mass limit but are not in orbit around a star or brown dwarfs - these are sometimes called sub-brown dwarfs or free-floating planets. OSB: What is the significance of CoRoT finding a BD? Are they rare? SA: Brown dwarfs are not rare in themselves, on the contrary. It is difficult to detect and study them, because they are faint compared to stars, so we don't know as many of them as we know stars, but over the past 20 years, with the advent of better and better infrared detectors, we have been discovering many of them. What is extremely rare, however, is to find one in a tight orbit around a star, as in the CoRoT-15 system. Until a few years ago, we knew of none at all, and this absence was called the 'brown dwarf desert'. Now we know of a handful, but CoRoT-15b has the shortest orbital period of any known brown dwarf. The very existence of CoRoT-15b in its tight orbit is interesting (see below), but the fact that it transits across the disk of its parent star makes it even more useful, because it enables us to measure its radius. OSB: What can they tell us about how planets & stars evolve? SA: Systems like CoRoT-15 are very important to understand star and planet formation as well as evolution. The majority of brown dwarfs are thought to be the result of the same process which forms stars. Stars form from giant clouds of gas and dust. Regions in these clouds which are marginally more dense than their surroundings attract more material onto themselves, and these over-densities grow and grow until thermonuclear fusion ignites in the core, and a star is born. If a clump never grows large enough for that to happen - because the material within its gravitational influence runs out - you get a BD. So, from the formation point of view, there is nothing fundamentally different between a star and a brown dwarf, but whilst tight binary stars are quite common, tight binary systems involving a star and a brown dwarf are rare. 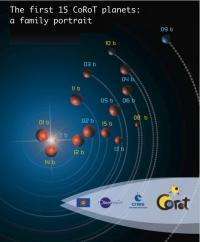 Why is CoRoT-15b different? Did it get kicked into its current orbit by a close encounter with another star? Could it have formed like a planet, which forms in the disk of material accreting onto a star, instead? There are very few BDs in close binaries, and even fewer which transit their parent star. These are the only BDs whose radii we can measure, so they are very valuable. If you make a plot of radius versus mass for stars and planets, stars all more or less fall on a single line, which basically is the line you expect for a self-gravitating ball of Hydrogen. This line flattens out at low masses - from 0.1 solar masses to a Jupiter mass, the expected radius is about 1 Jupiter radius. However, the measurements for exoplanets are scattered, with a range of radii observed for a given mass. This is because the radius of a planet is affected not just by its mass, but also by its composition (how much solid versus gaseous material it contains) and by the amount of light it receives from its parent star. CoRoT-15b fills an important gap in this diagram, between low-mass stars and planets. It's also extremely close to its star, so extremely hot, and hence a particularly strong test of just how much intense irradiation can affect the radius of an object of that mass. OSB: How might our solar system be different if it contained a BD? SA: We know that having a binary companion does not prevent planet formation, since we know of stars which have both one or more planets and a binary companion. If the Sun had a wide BD companion, the solar system would not necessarily be very different. We would definitely know about it, however: BDs are faint compared to stars, but a BD that close to us would not be missed. On the other hand, if the BD was very close-in like CoRoT-15b, things would be very different. I'll consider two possibilities: If the BD formed in-situ, there would be no disk, or very little of it, around the Sun, for the planets of the solar system to form out of. There might have been a disk around the binary (we have seen such disks around other binaries) and it's conceivable that this disk might form planets. We currently know of no such circum-binary planets, but this is at least in part because it is harder to detect them. But if the BD was captured (or kicked into a close orbit from a wider one) after the Sun had formed its planets, then that would most probably have a very dramatic impact, as the gravitational influence of the inbound BD would wreak havoc on the planets and most likely eject them from the solar system! OSB: What do we hope further CoRoT finds could reveal about BDs? SA: CoRoT already found another transiting BD, CoRoT-3b. It is less massive and less close in than CoRoT-15b, but the fact that CoRoT found two of these very rare systems shows that it is well-suited to detecting them. Along with the NASA mission Kepler, which is also searching for transiting planets, CoRoT can hope to discover several more systems like these in the next few years. They will tell us more about how these rare systems form, about what forms the difference between a massive planet and a BD, and about how BDs evolve when very close to their host star. CoRoT-10b is an interesting find. I'm sure we were bound to find planets in all kinds of orbits, but that sounds like a pretty extreme eccentricity. I'm sure that would put a damper on any other planet formation with a crazy giant like that swinging back and forth through the system. Sounds like it's in a close orbit, but with swings like it has and a huge mass I'm sure it could perturb the orbits of planets pretty far out, either kicking them out of the system or preventing their formation/stability. You'll probably find even more just how diverse planets and planetary systems are. I can make a very speculative statement: They're ALL unique. As astronomers find more and more of these exo-planets it will become very clear that they are indeed unique. Each one of them with it's own set of distinctive characteristics. At some time or the other it will also become apparent that it's impossible to adhere to the clouds of dust theory of planetary [and star] formation and a new theory will have to be proposed. Nothing wrong with that, just that the sooner it happens the better. We're watching exoplanets accrete by this very mechanism right now. Are you really this hung up on creationism? I think you need to step away from the keyboard and learn something before you return to the site. Your knowledge of current science is laughable.